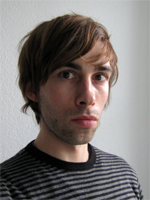 Adrian Bremenkamp studied Art History, Philosophy and Classical Archaeology in Berlin and Paris. As a doctoral fellow in research project (C-5-9) Italia Illustrata, he investigates conceptions of space and identity in texts and images from within and around the Aragonese royal court in Naples. His research follows two main paths: One is the exploration of the reception of so-called Early Netherlandish painting in southern Italy and Aragon/Catalonia in the early 15th century and its relation to the fashioning of identity. The other is the study of treatises on geography and history commissioned by the aragonese court, especially with regard to their specific conceptualizations of local, dynastic, trans-regional and/or ideal spaces. He completed his doctoral thesis on „Altniederländische Tafelmalerei in der Krone Aragon – Tradition und Übersetzung“ in 2017. Zu Identität und Repräsentation anhand einer Medaille Alphons I. von Neapel aus dem Jahr 1449 n. Chr.